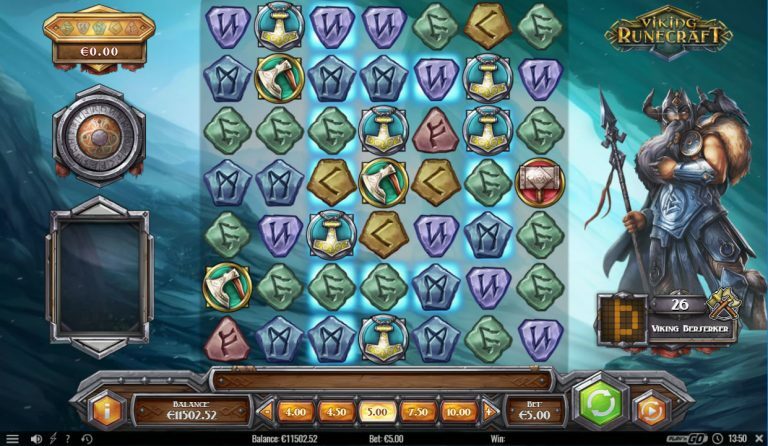 Viking Runecraft slot is a cascade-based slot game from the world-famous developer Play ‘n GO. It is made up of a large 7×7 grid, where symbols in a winning combination crumble away and are replenished with new symbols, for potentially even more combinations. Inspired by the stories of ancient Norse gods, the game is sure to blow you away with its sharp graphics and epic sound effects. Let’s take a trip to Valhalla and see what this unique slot game has in store! As soon as you launch Viking Runecraft, it is sure to make a strong first impression. The impressive visuals, with the Viking god standing guard menacingly on the right-hand side, give the game a mysterious yet attractive look. The game just feels alive, thanks to the sound effects and animations triggered during play. To play and win, all you have to do is get clusters of 5 or more identical symbols on the 7×7 grid either vertically or horizontally. Each combination is followed by the cascade feature till there are no more wins and the round ends. You can use the buttons located at the foot of the grid to bet anything from 0.10 to 100 credits for each spin. The Gift of the Gods feature occurs at random on a non-winning spin. There are 4 gods, each with their own unique feature. Thor strikes the grid with lightning to create between 5 to 9 wild symbols; Odin provides 4 wilds in groups of 2; Freya’s light creates wild symbols in clusters of 4 until at least 1 win is attained, and finally, Heimdall rewards you with a wild symbol on each row. In the background of the main grid, you will see patterns highlighted by white and blue glowing lights. Every time you get a combo that clears a pattern, you advance a level and are rewarded with one of the four gods being present. The aim is to try reach the level of the gods. Fury of Fenrir – four diagonal lines are chosen and then two are removed and the remaining two transform into matching symbols. Judgement of Jörmungandir – a chain of symbols on the gird are selected, most get destroyed and some transform into matching symbols. 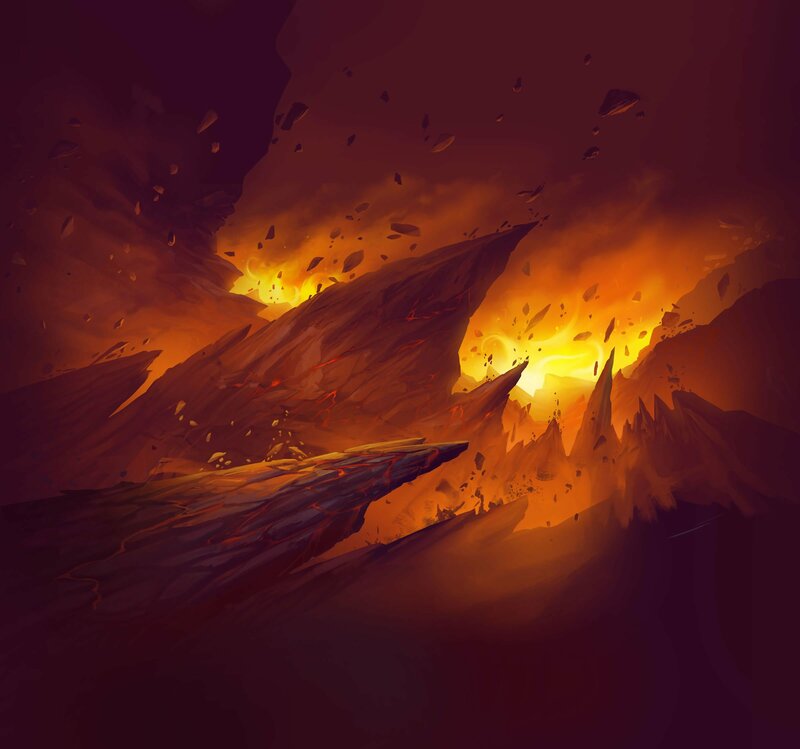 Scorching of Surtr – three different symbols get selected and those surrounding it are destroyed and selected symbols are duplicated. Lure of Loki – all of two different symbols are chosen. All of the one symbol group are destroyed, and the second group transforms into the same symbol as the first group to create huge combinations. The Ragnarök Feature can be triggered in two ways and it awards a free spin. The first is to get 20 additional symbols after any Charge of Destruction feature described above or by getting at least 40 symbols before a Charge of Destruction feature. In the awarded free round, after any regular wins, each of the four Charge of Destruction features get triggered, plus all wins during Ragnarök get a wining multiplier, up to a maximum of X15. All of the high-value symbols on Viking Runecraft feature an icon related to each of the gods. They are a medallion, a helmet, an axe and a hammer. On the other hand, the lower-value symbols show stones of different colors with Nordic characters carved in them. The wilds appear as different golden symbols and vary depending on the god standing guard at the time. All the winning symbols you get, help to build up to the Runes of Valhalla bonus. There are up to 5 Rune stone symbols that can form winning combinations. When you get at least one Rune Stone combination to clear the currently active pattern, you unlock the bonus round. In the bonus, you will then be presented with a wheel to spin and if you manage to hit a field that is active, you win the corresponding bonus prize. The more symbols you pick, the higher your chance of winning the Runes of Valhalla bonus. Vikings Runecraft does not boast a dedicated free spins like other slots, but the plethora of features, certainly makes up for this. Viking Runecraft has no dedicated jackpot and no progressive jackpot. Once again, the huge number of features provide plenty of gigantic prize potential. Betting Lines. The game doesn’t work like traditional paylines as the aim here is to achieve the clusters of five or more symbols, either vertically or horizontally. Viking Runecraft has a return to player of 96.4%, which is well within the average for this class of video slots. If your attitude to playing slots is “go big or go home”, then Viking Runecraft’s high volatility will be right up your alley. You won’t see lots of wins often, but when you do, the possibility for some incredibly large wins is possible. Viking Runecraft is a slot whose gameplay is dynamic, thanks to the epic features and bonuses that have been packed into it. The only downside to this slot is there are so many features that it takes a fair amount of playing till you understand what is going on. Play ’n GO really went all out to develop a full-package game that sports great entertainment, animations, sharp graphics and sounds, dynamic gameplay, and of course, massive wins.